What a great gift! 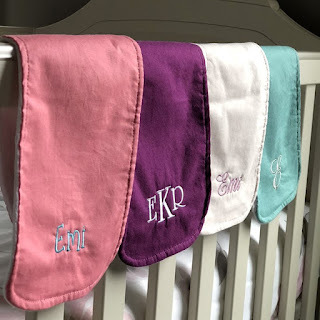 These Monogrammed Boutique Burp Cloth | Free Shipping $9.99 (Retail $19.50). Looking for a sweet and practical new baby gift? Add a personalized monogram to these beautiful little handmade burp cloths and you're sure to delight any new parent. Bright cotton front and cuddly Minky backing pair perfectly on these darling little burp cloths. Price includes one handmade burp cloth with a monogram or name embroidered on it. Choose from a variety of popular fonts and embroidery colors.